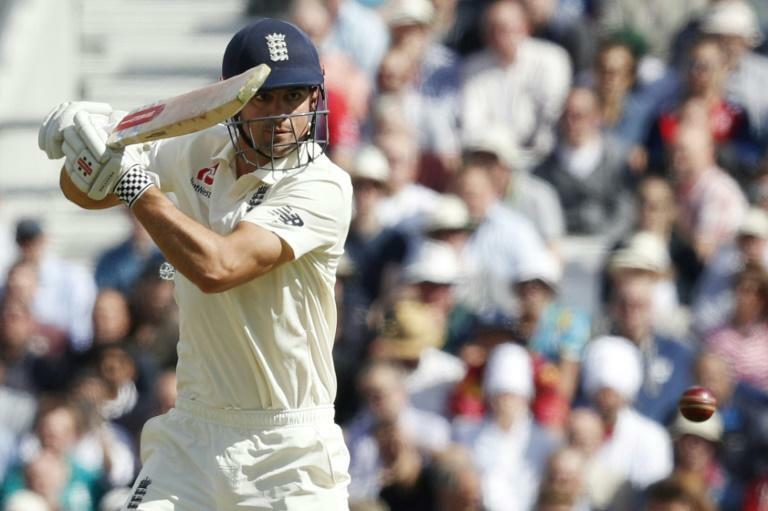 Alastair Cook was dismissed for 71 in his final international match on Friday, with a capacity crowd at the Oval rising to their feet to salute England's record Test run-scorer. Cook -- who is likely to have one more chance to bat in the second innings of the fifth Test against India -- played onto his stumps shortly after tea, ending his bid for a 33rd Test hundred. His dismissal after England battled hard to reach 133-1 in the face of naggingly accurate Indian bowling, triggered a collapse as the home side lost three wickets for one run in just nine balls. Earlier, Cook walked out to bat at the start of play through a guard of honour from the tourists and was given a sustained standing ovation from the crowd as he made his way to the wicket. On a sun-drenched late summer morning in London the former England skipper, playing in his 161st and final Test, put on 60 for the first wicket with Keaton Jennings before his partner was dismissed. Cook, 33, who has struggled for runs this year, was dropped in the gully by Ajinkya Rahane off Ishant Sharma soon after the lunch break when on 37. He reached his half-century with two runs down the ground, which again brought the crowd to their feet. But with Cook looking set, Jasprit Bumrah induced an inside edge and the ball ricocheted onto the batsman's stumps to the disappointment of the crowd. The Essex opener, with a previous highest score of 29 in the series, scored his 71 runs from 190 balls, with eight boundaries. Following his dismissal, captain Joe Root was lbw to Bumrah for 0 in the same over and Jonny Bairstow was dismissed in the following over, also without scoring, caught by wicketkeeper Rishabh Pant off the bowling of Sharma.